Master Estheticians Kristy Harris and Stephanie Willis work for some of the Valleys most renowned Plastic Surgeons. The offices of Dr Daniel I. Shapiro MD, FACS and Dr Geoffrey E Leber MD, FACS are both located with in the Paradise Valley Cosmetic Center. The stunning, Paradise Valley Cosmetic Surgery Center is located at the base of the Camelback Mountain, in Paradise Valley, creating breathtaking views. The patient experience is one of indulgence, serenity, and luxury. Beauty is not a luxury, and exceptional service is not exclusive to the elite. Beauty is not reserved for the young, famous or wealthy. Stephanie and Kristy believe that everyone should have the opportunity to achieve beautiful healthy skin and that everyone deserves personalized care, unique to their skin and lifestyle. Nobody should ever feel the need to risk their skin or body to the inexperienced. The offices of Dr Daniel I. Shapiro, MD, FACS and Geoffrey E. Leber. MD, FACS are both located in the exclusive Paradise Valley Cosmetic Surgery Center, and are designed to provide full comfort and privacy. Those that require exceptional privacy can make arrangements to enter through a private entrance or schedule treatments during private hours. At Paradise Valley Cosmetic Surgery Center, the utmost care has been taken to ensure privacy and security. Kristy Harris and Stephanie Willis are nationally recognized Estheticians and Certified Laser Technicians with extensive training in medical aesthetics and aesthetic laser treatments. They are part of an elite list of go to skin specialists, with clients traveling from all over the world seeking their professional skin treatments. They have maintained a sincere and gracious attitude treating every client as a VIP. After years of experience, they continue to be ambitious and excited about the field of medical aesthetics. Stephanie and Kristy’s girl next store personalities are a refreshing find in the industry. They are positively charismatic! Kristy is proud to be a part of the prestigious team at Shapiro Aesthetic Plastic Surgery and Skin Klinic. Kristy began her career as a make-up artist and is also a trained massage therapist, however aesthetic skin care is her talent and passion. She is also uniquely experienced, specializing in treating skin of color. As a licensed esthetician, she quickly entered the world of medical aesthetics in February, 2000. At a time when aesthetic laser treatments were fairly new to Arizona and were only offered at a handful of clinics. She was busy,working long hours to satisfy the demand for treatments, while gaining priceless experience. She quickly developed a successful reputation for her knowledge and talent of aesthetic laser treatments. Kristy was among the first in Arizona to perform Photofacial IPL treatments, initially utilizing the techniques developed by Dr Bitter SR, M.D, the creator of the original PhotoFacial procedure. She has also been educated by Dr Bitter JR, M.D. in aesthetic laser treatments and is certified in advanced Levulan PDT (photodynamic therapy). With years of experience and training, she has developed her own advanced technique that is available exclusively to her clients. Kristy has also had the privilege of attending education workshops in California and New York with the world renowned Dr Zein Obagi M.D., learning proper procedure for the Obagi Blue Peel as well as skin health restoration and rejuvenation. Having a great respect for Dr Zein Obagi, she has adopted many of his theories and protocols, implementing these ideas in her skin regimens. In May of 2014 Kristy was selected by OMP/Valeant, to be a member of an “Aesthetic Leadership Community”. Very early in her career Kristy developed an interest in the unique skin care needs and challenges associated with ethnic skin types, and began to seek specialized training and education for treating skin of color. She felt that there were very few esthetic professionals that had a good understanding of the effects products and treatments can have on skin of color. Inadequate knowledge or experience can be dangerous when treating skin of color, leading to adverse reactions, burns and scars. Kristy continues advance her knowledge and understanding of treating skin of color through experience, education and training, including completing a course in “Laser Treatments of Patients of Color”, from the American Society For Laser Medicine and Surgery, INC.
You can schedule a consultation with Kristy at Shapiro Aesthetic Plastic Surgery and Skin Klinic. A state of the art facility with all the best amenities, Shapiro Aesthetic Plastic Surgery and Skin Klinic was developed by Daniel I. Shapiro, MD, FACS as an exclusive full service facility. He has carefully recruited an exceptionally talented team that is arguably the most experienced in the Phoenix/Scottsdale area. All estheticians are licensed by the state of Arizona and certified laser technicians. The nationally recognized staff of nurses and estheticians have been treating Arizona’s elite for over 25 years, and have exceptionally high standards of quality. Stephanie is proud to be a part of dedicated and highly skilled staff of the award winning Geoffrey E. Leber, MD, FACS. Having a natural gift for aesthetics, Stephanie began her career very early and immediately entered the field of medical aesthetics in the beginning of 2003. She is extremely passionate about her work and it shows. Her clients always appreciate her thorough manner and customized treatments. A lot of time and consideration goes into every treatment to ensure her clients satisfaction. It’s no wonder her clients travel many miles including out of state to receive very personalized care. Stephanie specializes in laser resurfacing procedures, photorejuvenation, and facial contouring. She is committed to offering the most advanced treatments as well as adding new and ever changing protocols to include multiple modalities to ensure optimal collagen stimulation. She also has extensive background in chemical peels, microdermabrasion, and dermal planing. In addition to her aesthetic talents, she has an uplifting personality that is contagious and valuable in itself. The experience provided by Kristy or Stephanie, is one of personalized evaluation and treatment in an environment of privacy, quality, and tranquility. During a consultation your esthetician will first listen to your concerns, then educate you on your specific treatment options. Your esthetician will create a treatment plan, tailored to your specific needs. Your personal esthetician will then guide you through your journey every step of the way. Finally, a customized skin regimen will ensure prolonged skin care. All of the services offered are customized to fit individual needs. 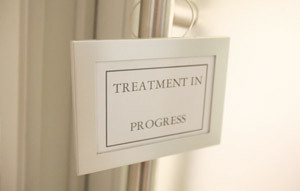 To provide the most current and effective skin treatment our Menu is constantly growing and evolving.